Last week, my friend asked me if I could do her nails (we will call her by my favourite nickname for her: Yaz). She really liked the nails that Samantha was sporting in SATC2. Yaz loaned me the other, which I watched on the computer so I could screen cap the nails as I could not find them via the internet ANYWHERE! I got to see them again last night.. We did these on either Wednesday or Thursday (I for the life of my cannot remember.. The days all blend together lately..) and she hasn't lost a single gem! 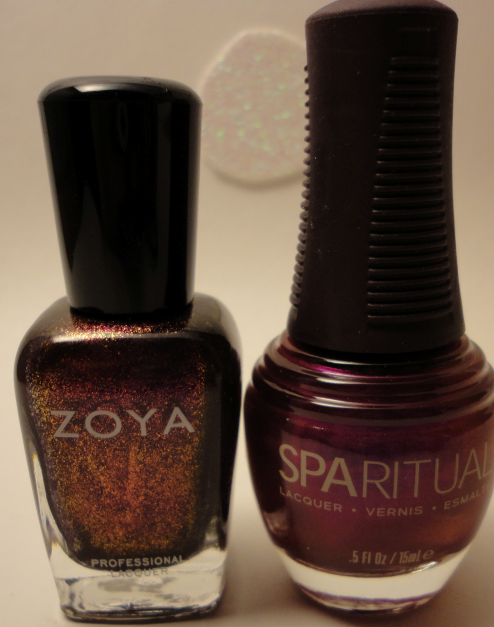 We have Zoya Valarie and Sparitual Drop Dead Gorgeous. When I ordered these, I was obviously loving purple. I ordered them from a new (to me) company that was recommended by a friend. I actually ordered three polishes.. And yet there are only two pictured. I am still waiting for OPI Black Shatter to show up. This company has terrible costumer service.. I will never be doing business with them again. Which brings me to a question for all of you: What (if any) websites do you order polish from? I used to order from TD, but now shipping is $20 regardless. I am looking for a place that either ships to Canada or is located in Canada, is up to date with collections AND won't cost me a small fortune to ship polishes. I also had Valarie on for a few days.. I forgot to photograph before work yesterday.. The application and colour is amazing! I cannot wait to add more Zoya to my collection! And I am currently awaiting the arrival of my CG Crackle polishes! Woo! Ditto, looking for the same thing! I hate feeling ripped off.